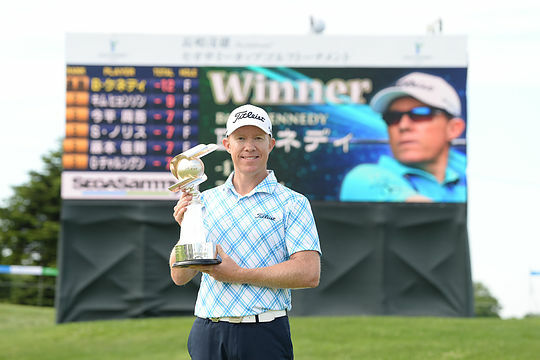 44-year-old Australian Brad Kennedy has claimed his third title on the Japan Golf Tour winning the Shigeo Nagashima Invitational SEGA SAMMY Cup by three shots. The Queenslander fired a career-low nine birdies for a round of 64 to move from 8th place overnight into the rain-shortened 54-hole lead for his first win on the Japan Tour since the 2013 Kansai Open. Despite the long drought between victories, Kennedy hasn’t been sitting idle with five top-10 finishes to his name just last year including an outright second placing at the prestigious Japan PGA Championship. In 2016 he claimed the NZ PGA Championship making it a Kiwi double after previously winning the New Zealand Open in 2011. “I haven’t won for in Japan for five years, I’ve forgotten a little about what it feels like so it’s good to have that feeling again,” said Kennedy, who becomes the first Australian to win the title. The victory will give Kennedy exemption on the Japan Tour through to the end of 2020 with Kennedy joking to the media that he might try out for the Tokyo Olympics that year. Kennedy takes home a first prize cheque of ¥22,500,000 (AUD$275,000) that will see him move inside the top 10 to No. 8 on the Japan Golf Tour moneylist with ￥30,375,250 (AUD$370,000). Despite a solid start, New South Welshman Won Joon Lee fell away on the final day with 2-over 74 to finish in a tie for 26th with David Bransdon another shot back at 3-under at T33. Anthony Quayle was the only other Australian to make the cut at T55. Aaron Townsend, Brendan Jones, Scott Strange, Matthew Griffin, Aaron Wilkin and Andrew Evans missed the weekend cut.